Which 2011 Barrett-Jackson Vehicle is the Car of Your Dreams? This weekend's Barrett-Jackson Car Auction features a wide variety of cars and trucks. Many of the cars have already crossed the block and found new owners, but you can still dream. What is the 2011 Barrett-Jackson vehicle of your dreams? This is the 40th year the Barrett-Jackson auction house has been holding their collector car auction in Scottsdale, Arizona. When the auction started no one could have predicted the six day 1200+ car extravaganza it has become. Some people think Barrett-Jackson is destroying the car hobby by driving car values up reflective of their sky high selling prices. The auction house has certainly been a source of some controversy in the car hobby. Since 1997, the Speed channel has been making up for untold hours of NASCAR analysis by broadcasting live coverage of Barrett-Jackson each January. Regardless of whether you endorse the Barrett-Jackson collector car mentality, if you are anything like me, you look forward to the middle of January to see some unbelievable cars sell for even more unbelievable prices. Watching the auction it becomes pretty clear that there is something to please almost any automotive taste, from Lincolns of the 1920s to modern day Toyota Camry stock cars, there is bound to be something that attracts almost anyone. Looking at the list below you can see every car that has been/will be sold at this year's event. The price and quality of the cars culminate Saturday afternoon (right about now), which is when the most high profile and high dollar cars sell. Taking a look at the list of cars below, if you could pick from the cars sold at this year's Barrett-Jackson, which would be the car of your dreams? This question, although unrealistic, is a tough one. Almost being sidetracked by a custom Divco milk truck, a replica Goggomobil Dart, a one of 547 Buick GNX and a 1957 Desoto Adventurer Convertible, I finally decided on the 1959 Plymouth Atomic Punk Bubbletop. You may remember our feature on the Atomic Punk in 2008 shortly after it was finished. While I have known quite a few 57-59 Plymouths in my life, none have ever been anything like this one. There isn't much besides the fins and the headlights to indicate that the Atomic Punk was derived from one of Virgil Exner's creations. 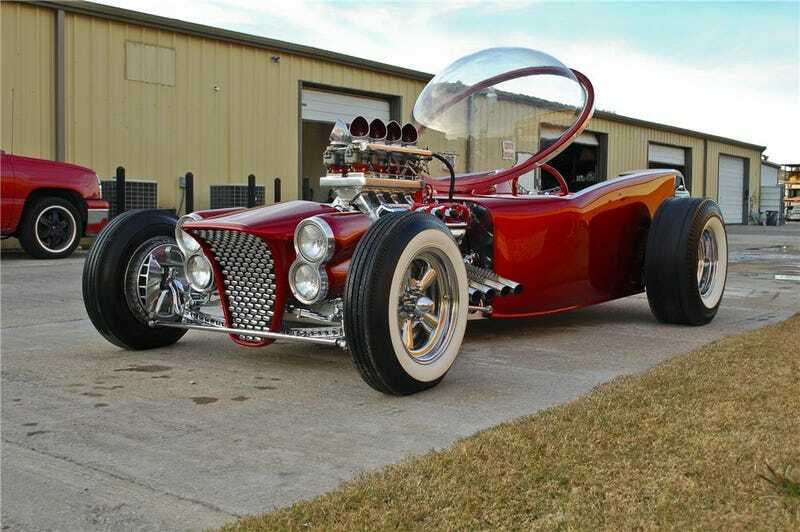 The design of the Atomic Punk is heavily influenced by Ed Roth's show cars of the 1960s, right down to the bubble top which was actually hand blown by the builder. Powered by a 400hp 392 Hemi and covered in pounds of metal flake, I would love a chance to bake in the sun at the wheel of the Atomic Punk. I've told you about the Exner based and Roth influenced Hemi powered hot rod I'd love to see sitting in my garage, so tell me, what is the 2011 Barrett-Jackson vehicle of your dreams?